SEOUL, June 21 (Yonhap) — “Fight For My Way,” KBS 2TV’s coming-of-age romantic series, led the Monday-Tuesday late night drama race, while two smaller rivals shows duked it out hard for second place, according to data Wednesday. Episode 10 of “Fight For My way” aired on Tuesday recorded 11.2 percent viewership nationwide, according to Nielsen Korea. 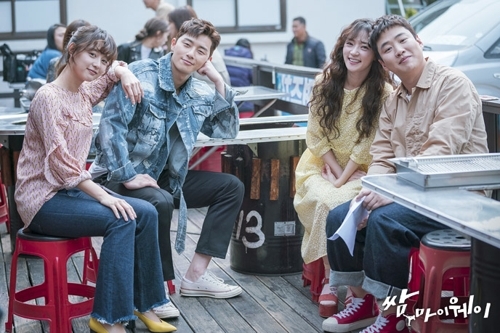 Starring Park Seo-joon and Kim Ji-won, the show centers around a group of four young adults, who say they have “third-rate lives” due to their mundane and mediocre lives, but later push forward to realize their unfulfilled childhood dreams. SBS TV’s “My Sassy Girl,” a romantic comedy that is a remake of the Jun Ji-hyun movie from 2001 but in a Joseon-era setting, came in second. Episode 16 and 15 recorded 10.3 percent and 8.3 percent, respectively. The show aired in a new format in which a one-hour conventional TV episode is split into two half-hour airings with ads inserted into the middle. MBC TV’s “Lookout,” an action crime drama about a group of vigilante hackers pursuing justice outside of judicial boundaries, finished third. Ratings for episode 19 and 20 came to 8.5 percent and 8.6 percent, respectively.